this is because the 'RotationPeriod' for 'R136a1' is not defined in the database, and SpaceEngine therefore assumes a random value for it. Often a bit too high. Thus, the stars become oblate spheroids. Even if they are not in reality. In fact, the average temperature in Earth is about 14 degrees. That's the average of the temperature in the entire planet, including the cold poles and the hot deserts. Look at this article in UniverseToday. Thank you for your opinions JackDole, Fireinthehole. Agreed. Maybe, just maybe (if it's not some titanic work as in oblateness switch in edit mode), it needs to be included realistic manually, some the proverbial "the most..."-objects like above said or canis majoris for Example. Because it could've been the first thought of a newbie to see some real power of the universe. And until Worm Holes are proven as a reality they will also not be implemented in Space Engine. As of 0.9.7.4 Wormholes have been partially implemented and will be fully implemented in a future version. Currently there is no plan to procedurally generate them, but there is always a chance they will be used in addons and future games. 1. COMPASS OR SOME ANALOGUE (named otherwise for disambiguation) on round objects, planets and moons (excluded maybe several small objects like asteroids with no stable axis) with four cardinal points based on lat/long coordinates which are already implemented by the way. WHY DO ONE NEED THAT? Personally landing on big planet (even our home Earth) I'm feeling like newborn little mouse, without having a basic idea of my current direction (vector) and it severely spoils any exploring pleasure. ps. Thank you for reading. I know, It's a ton of letters . Greetings fellow Spacelings. I'm here today with a bit of a star size bug. I went to visit the Milky Way's center and said to myself "Hmm, some of these stars seem really bright" and upon inspecting a few, I found they have a diameter of 39 AU! That's 4200 times the Sun's diameter. These are definitely new as I have visited Sag A* many, many times before RC1. Those two bright stars in to the left of the nearest one are identical in diameter. For perspective, the top one is .065 ly away, and the bottom is .125 ly away. Even without much mental comparison, I can tell those are some extremely big, luminous stars. 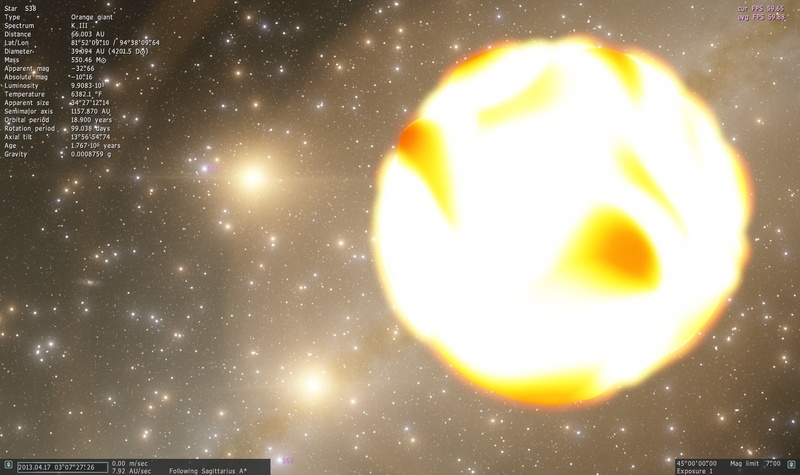 I've seen huge stars - the biggest I have personally found was about 1900 times our Sun's diameter. Certainly an outlier, because the majority of orange hypergiants I find are in the 1000-1200x solar diameter range. So, my question is: is anyone else seeing these "ultragiant" stars? Thank you for your time, and I hope you're all doing well. Edit 1: After further inspection, it seems some galaxies don't have their core orbiting stars, i.e. Andromeda and Triangulum. Also, the majority of stars surrounding Sag A* are identical blue main sequence stars. Perhaps this is a bigger issue than just overly huge stars, and a problem with the centers of some catalog galaxies. Okay so something's got me puzzled. All this time I thought SpaceEngine was a 64-bit application, but the 0.9.7.4 RC1 I have installed is showing up in Task Manager as "SpaceEngine.exe *32". Is this patch 32-bit only, did I install it wrong, or was SpaceEngine always 32-bit (in which case do any plans exist to make it 64-bit)? Some interesting fact I have just encountered. I've been running SE rc1 on my tweaks in main.cfg off the first run. And it also crashed almost each time after 10-20 mins. And I said what the hell, I should run it on default author's cfg. So, Well ... How should I put it. Imagine my astonishment when I've started SE on default (deleted cache, original main.cfg and so on) and it's not even started. Crashed on site. In C++ it's not so hard to switch from 32-bit to 64-bit, I don't know if there are some functions/libraries that would not be working anymore, but usually it's not such a big problem. Anyway, I'm not even sure if there would be so many benefits to justify the release of two different versions (x64 and x86). @Brett001 : Don't ask. He can't know. So you can't either. This kind of feature takes a lot of time, and probably requires a lot of other thing you don't even know. For now, the focus is on Release Candidate 2, to give us a clean patch at last, with less bugs, more features.